When you don't have much time to create a great dinner dish, then it is Ravioli Lasagna to the rescue. The flavor of this dish is delicious and it takes very little time to put it together. Often times we have unexpected dinner guest and this is a dish that I recently served my dinner guest and had them coming back for seconds, it is really that good. This is a great dish for those busy days when extra friends and family come to the table to share a meal. Pour enough sauce in a 9X9 baking dish to cover the bottom. Add 1/3 of the raviolis in an even layer, and top with more sauce and cheese. Repeat the layers two more times, ending with the remaining mozzarella. Top with the Parmesan and cover with foil. Place in the oven and bake for 45 minutes at 400 degrees. Remove the foil and allow to cook uncovered 15 minutes more, until the cheese is golden brown. Remove from the oven, and let stand for 10 minutes. I sure hope that you enjoy this really easy Ravioli Lasagna it is delicious. Just add a salad and some garlic bread and it is a great meal. Thanks so much for stopping by to enjoy this recipe with us today. Have a fantastic week and come back to see us real soon! "The Following Recipe Was Doubled For This Blog Post"
The recipe is for 9X9, but the recipe was doubled for the blog post so I used a 9X13 baking dish for the photo. Thanks for stopping by and sure hope you enjoy the recipe. Ravioli lasagna sounds wonderful! I've be wanting to try something like this for one of those busy nights! This looks delicious! I made a slow cooker ravioli lasagna this week, Miz Helen, but next time, I'm trying your recipe! It looks and sounds fabulous. I'm thinking that it would be good to put together and then freeze it for later use. This looks amazing! Thank you so much for linking up at Tasty Tuesday! This post has been pinned on the Tasty Tuesday Pinterest board! I love having you and can't wait to see you next week! 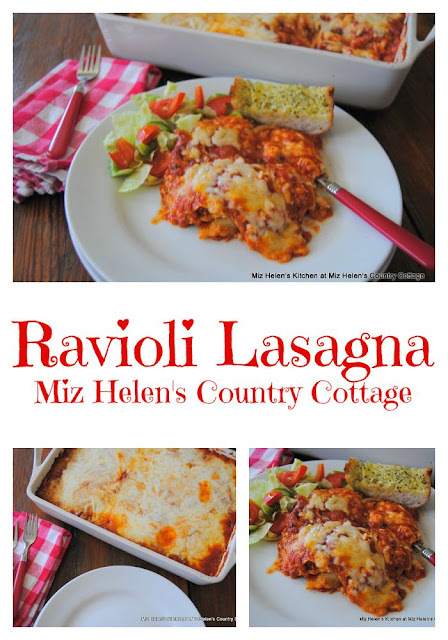 Thanks for sharing with Hearth and soul blog hop, delicious, love this version of Lasagna, tweeted and pinned.